the Vedic personification of Mercury. Mercury is the ruler of the nerve forces and mental faculties. This is the closest planet to the Sun, never further than twenty eight degrees away and it completes it's orbit in eighty-seven days and twenty three hours. Mercury takes on the qualities of the planets with which it is in proximity and as such, it can be good, bad or lucky or unlucky. Mercury takes on the characteristics (vibrations) of whatever sign or planet it is aspected by. A person born under a strong influence of Mercury is tall, has straight fingers and legs, a narrow face, long arms, hands, fingers, legs and feet. This person will have a strong mind, an active, subtle, retentive memory. If Mercury is debilitate or afflicted, the native will possess a mean, fickle and unprincipled character. The native is prone to be a liar, a thief and a gambler, yet may be prone to being conceited. When Mercury is not influenced by Saturn, it is the native must an effort to be concrete in their plans and to avoid making promises without carefully considering the extent of the commitment. It is also essential that the native should try to visualise as perfectly as possible, any new project or personal interview before attempting it. If not, the native may have to pay with embarrassment and expense. People who have a strong influence of this planet find it difficult to realise that others are not as frank and as sincere as they are and they are therefore in danger of mistakes by being too trusting and optimistic. It is therefore imperative that the native of this planet should not be too credulous and should be careful about those with whom they enter into dealings with so as to avoid a betrayal of confidence. Mercury governs the thought centres of the brain and memory. It also governs speech, the nostrils, the hands, feet, lungs and nerves. An individual with an exalted Mercury, becomes distinguished in intellectual and literary pursuits. But those with a particularly debilitated or afflicted Mercury can deceitful and cunning and may turn out to be swindlers, forgers and thieves. Mercury is a sensitive planet that responds to every impression, but Mercury is not swayed by the signs as are the more passive planets. On the other hand each sign excites Mercury to give a special impression of opinion. Saturn has favourable influence upon Mercury, without Saturn's steadying hand, Mercury may be frivolous and vain. But when Mercury is overpowered by Venus, mental qualities become subservient and slavish, that is the concerned individual may not have a mind of his own. Nevertheless, whatever aspects exist, they will not alter the essential character of this planet. People under the influence of this planet have a great desire for knowledge, the longing for change and a cosmopolitan spirit. They are bound to travel far and wide. They have keen intuition and ability to sense what people are about to say. A common trait is to interrupt conversations and to change the subject so quickly that others find it difficult to follow them. A lot depends on the environment and mental development of the native, whether his/her inquisitive nature will cause them to be inquisitive about petty things or those of greater importance. They can be restiveness and tend to be easily bored, due to their own 'Mercurial' nature. They lack the ability to be decisive, they change their thoughts and plans often and when Mercury is debilitated or afflicted, they can become unnecessarily confused or unduly perturbed about simple matters. The mind of a person with a strong influence of Mercury is never at rest and because of this, they require more rest and sleep than the average person. They must guard against being too introspective and should associate as much as possible with spiritually minded people. In Sanskrit the Mercury is called 'Buddh' and this name is used in Vedic astrology. Mercury is the prince among planets, and represents the mind and intellect. It represents happiness and joy, courage, knowledge, business and commerce, music and literature, luxury, romance, good memory, communication, speech, intellect, virility, wisdom, and intuitive power. It is the lord of Gemini and Virgo. It is exalted in Virgo and debilitated in Pisces. The diseases brought on by this planet are usually convulsions, speech impediments, stammering, lisping, dumbness, apoplexy, sinusitis, cough, colds, hoarseness, gout in the hands and feet and vertigo. An afflicted Mercury can cause mental diseases, madness, lethargy, nervous disorders and affilictions of the brain. It is of a dark green colour. It is the lord of the vegetable kingdom, minerals and spring season. It represents an alloy of metals and emeralds. The colour associated with the planet is green. 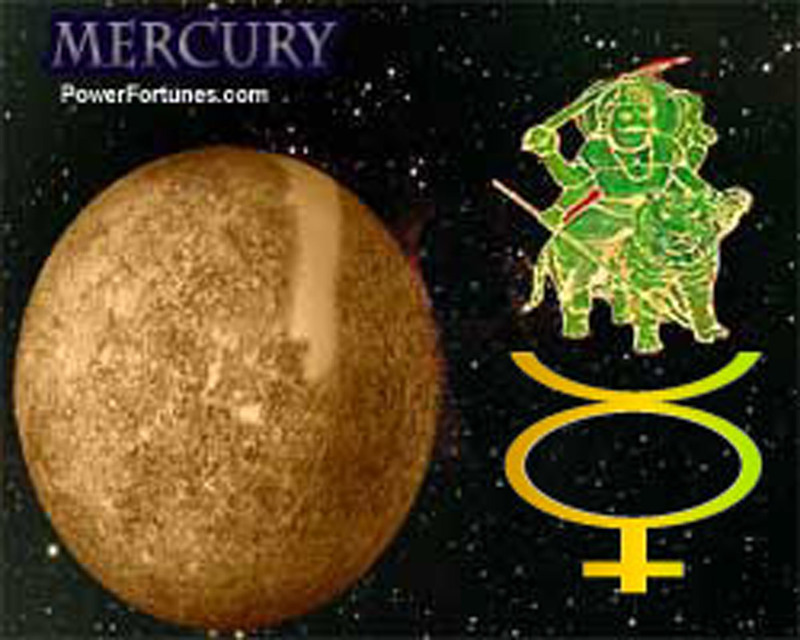 According to numerology, Mercury's number is '5'. The direction associated with Mercury is, North. The corresponding talisman for Mercury is the 'Buddh Yantra'.